Motor play in most early intervention center programs tends to involve unstructured time in a gross motor room, or playground, to let the kids move around and burn off steam; however it tends to be a crazy, free for all kind of period of the day where both staff and students leave frustrated. Many of our students often feel lost when not directly engaged in a structured activity. We were finding an increase in challenging behaviors in our gross motor room due to the lack of planning and structure. Staff in the Philadelphia Division EI Center noticed this as a problem and began brainstorming new ways to make our gross motor time more effective. The goal is to provide opportunities for our students to practice a variety of skills including general gross motor play, following directions, waiting their turn, turn taking and social play, making and sticking to choices, functional play, requesting, and entering and leaving the room calm and organized. In January 2015, we were lucky enough to get a recreational therapy intern from Penn State and we knew this was a golden opportunity. With the help and leadership of our Recreational Therapy intern, Kate Shilkitus, wonderful things have happened. Not only are our children “burning off steam,” but also, they are practicing appropriate and functional play while following a routine and here’s HOW we made it all happen. The use of visuals to communicate expectations before they go to GM room. The use of visuals to show the children “what comes next” and the agenda for the session. 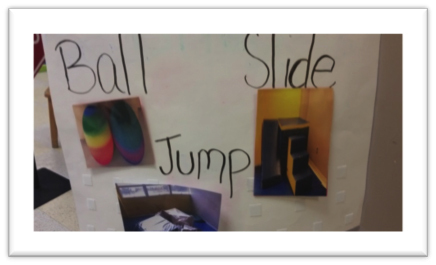 The use of choice boards and structured smaller groups within the larger gross motor room space to guide play. Bring/push class chairs down to GM room (heavy work that can be calming and organizing) for students to sit on at start, rather than opening the door and kids rushing in. Use “clean-up” as part of the session. Ending session with a calming/re-group type activity by the waiting area to build compliance momentum. Use of time during team meetings to make a plan for the week in the motor room based on the above items. We discussed the properties of the equipment available and various ways to use them to expand play schemes. Obstacle courses can be changed up mid- session. Staff modeled creative ways to use a ball or a wedge, for example. What levels of assistance we use and how to fade or increase as needed based on individuals. Based on ideas and feedback from the workshop, we began to put together visual materials, including a stop sign at door, marked places in the room for waiting areas, and activity and equipment use suggestions, but the prep work alone can be a very timely task. Fortunately having Kate, our recreation therapy intern, who was ready and willing to lead this initiative, we hit the ground running. We believe that what has made this program even more successful from the start is having Kate dedicate her time and energy in that room. Following our workshop, Kate spent a great deal of time preparing the environment and doing the prep work. She created several visuals and utilized the strategies discussed to create expectations with the use of visuals. Visual supports are crucial for many of our students so in creating these, Kate helped to set our students up for success. Here’s an example of our choice board that is set up everyday. Staff then model the different activities that can be done with each choice. Once Kate had everything prepped and ready to go, we rolled out the new program and collected baseline data on two skills: (1) Wait time with an expectation of average wait time to be 30 seconds to 1 minute with 2 or less redirections. (2) Following directions throughout the session with 2 or less redirections. 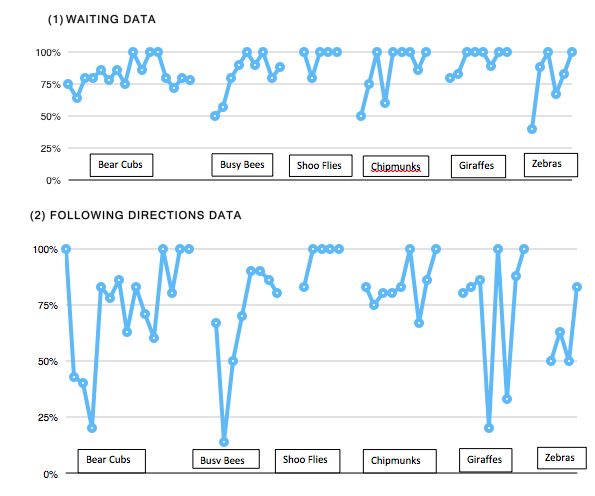 Kate has been collecting data daily and the findings are outstanding! We have seen a dramatic improvement in just a short time. The chart(s) below gives you a clear picture that this new program is most certainly working. Kate’s ability to help strategize, plan, and implement a new program is extraordinary. She spends endless time at school and at home reflecting on individual progress and the program as a whole. Unfortunately, Kate has left us as her internship has come to a close, but her hard work and lasting effects in establishing a consistent routine and program in our gross motor room are here to stay. The last three weeks will consisted of transitioning our teachers to lead and implement the program with Kate’s support. The teachers now feel confident in doing the same. We look forward to continued success with this program and our students. No longer do our teachers need to “burn off steam” after a chaotic session in the gross motor room. We have successfully implemented a new program that keeps both students and staff calm and having fun. This entry was posted in From the teacher, General info, Occupational Therapy and tagged Early Intervention, Easter Seals of Southeastern Pennsylvania, gross motor, Occupational Therapy on June 17, 2015 by Easterseals. “It’s Just Not Fair” is often heard throughout a preschool classroom, more so in an inclusive classroom such as Friendship Academy where students are treated and educated as individuals; meaning that praise is always given, but rewards are based on expectations of those individuals. We get excited for each and every achievement that happens in our classroom, but even the youngest of students notices when one student has a reward bin, or a penny board, or gets to take breaks after long activities. They catch on quick, they can get upset, they can sometimes be right. 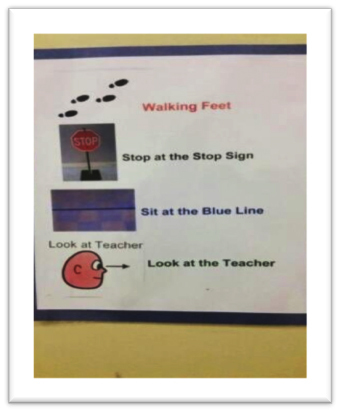 As a teacher I explain the situation in ways they understand, ways they can remember. I dance until they smile, I offer them the world. They still know it is not a sticker but it is enough for the moment to let them forget. As a preschool teacher, I get excited for all sorts of achievements. I may dance and sing more than I teach. A successful circle time, I dance. An awesome line in the hallway, I sing. A classroom of good listeners, I do both. As a teacher of Friendship Academy it gets a little different. All types of students have all types of achievements. Friends utilize full sentences, I sing. Friends keep hands to themselves or find ways to control themselves in exciting activities, I dance. Friends make basic vocalizations, I do both. Friends engage in a flawless transition from one activity to another, I do both. Friends go a whole day without a meltdown, I do both. Friends engage in an activity and try their best for two minutes, I lose my mind for that. I’m running out of stickers. This entry was posted in child stories, From the teacher and tagged Bucks County, Easter Seals of Southeastern PA, Easter Seals of Southeastern Pennsylvania, Friendship Academy, social development, social skills on June 12, 2015 by Easterseals. Walk With Me is just five days away, so it seems a perfect time to introduce our fifth Honorary Ambassador, JJ. There is still time to register for the Walk by clicking here. We hope you will join us on Saturday as we celebrate JJ and all of our Ambassadors. 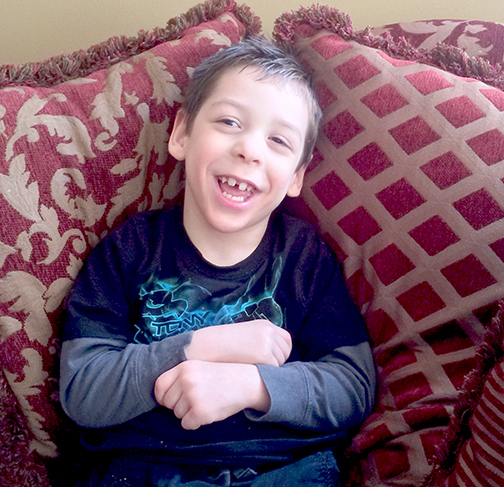 JJ is very social six-year-old who has PVL, Cerebral Palsy, Dysphagia and cortical vision impairments. JJ has tremendous inner strength and we have to believe so much of it comes from his parents, big sister, twin brother and huge extended family. When he was ready for center-based services, he also became part of the Easter Seals family. Since he began at Easter Seals, JJ has come out of his shell even more, his motivation is increased, his words have increased and he is holding his head up better. In addition to his increased words, he will soon be using an eye gazing device to really help him find his voice. When he’s not amazing his teachers, he’s quite happy rough housing with his siblings, playing catch and playing games on his iPad. He also loves watching sports and cheering loudly with his daddy. When asked to describe JJ, his parents summed it up by saying that JJ is their family’s rock star and inspiration. His love for life makes their days truly blessed. This entry was posted in child stories, From the teacher and tagged Approved Private School, center-based services, Early Intervention, Easter Seals, Easter Seals of SEPA, Easter Seals of Southeastern Pennsylvania, Walk With Me on June 1, 2015 by Easterseals.